Click on the graphic above to see a full-size version. 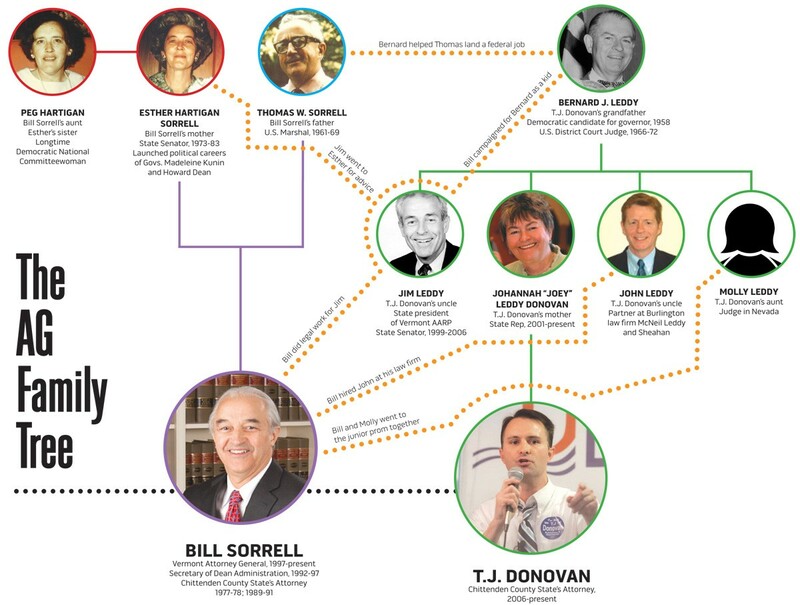 Tracing the family histories of Bill Sorrell and T.J. Donovan is like one big game of political connect-the-dots. Both are the products of prominent Democratic families from Burlington and they will face off this August in a closely watched primary for attorney general. Sorrell is the baby-boomer incumbent, first appointed by then-governor Howard Dean in 1997. He hasn’t faced a serious reelection opponent in 15 years. Donovan is the Chittenden County state’s attorney, an ambitious and politically savvy Gen Xer who isn’t waiting for Sorrell to step aside before making a run for his job. Over the last half-century, the Catholic families of the two candidates have intersected and intertwined like a Celtic knot — connections both men play up and down on the campaign trail. That’s made it awkward for some longtime friends and supporters. “It’s a challenge for many folks who know both families and both candidates from so many different perspectives to sort out who will be the best attorney general,” says Judy Stephany Ahearn, who represented Burlington in the Vermont House and Senate and has not endorsed a candidate. Ahearn also served as a senior staffer for former governor Madeleine Kunin — one of two governors that Sorrell’s mother mentored and encouraged to run. Esther Hartigan Sorrell also launched Dean’s political career. A longtime behind-the-scenes Democratic operative and eventual state senator, Esther Sorrell was a political force in Burlington when the Queen City was a Democratic enclave in a heavily Republican Vermont. The family lived in a home near Smalley Park in Burlington’s South End before moving to Hickok Place off Pearl Street. Bill Sorrell’s father, Thomas W. Sorrell, was a U.S. marshal appointed by president John F. Kennedy in 1961. The guy who helped Thomas Sorrell land that patronage job was Bernard J. Leddy, T.J. Donovan’s grandfather — for whom the public park and skating arena in Burlington’s New North End is named. A political power broker, Leddy was the patriarch of another Burlington Irish clan that lived up the hill from the Sorrells, on North Prospect Street. 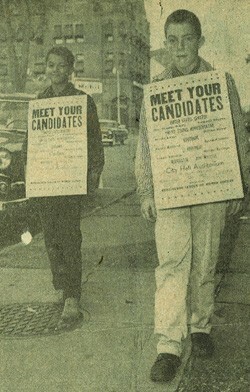 Leddy was the unsuccessful Democratic candidate for governor in 1958 — losing by just 709 votes — four years before Phil Hoff successfully ended 108 years of GOP rule in Montpelier. In 1966, president Lyndon B. Johnson appointed Leddy to a federal judgeship in Burlington. Bernard Leddy had five children — including T.J.’s mother, Johannah “Joey” Leddy Donovan — all of whom went to Catholic school and church with Sorrell and his four siblings. Bernard Leddy’s daughter Molly was Bill Sorrell’s junior-prom date at Rice Memorial High School in South Burlington. Son John T. Leddy became Sorrell’s law partner in private practice in the 1980s. Another son, Jim Leddy, hired Sorrell to do legal work for the HowardCenter when Jim was the mental health center’s director. Jim Leddy in turn says he leaned on Esther Sorrell for advice when she was a state senator and he was director of the state’s alcohol and drug abuse programs. Jim Leddy went on to serve in the Vermont Senate from 1999 to 2007. Imagine how it is for longtime Burlingtonians with ties to both families. Some are choosing to endorse a candidate; others, to sit the whole thing out. Attorney Joe McNeil isn’t publicly weighing in. He grew up with Bill Sorrell in the Queen City — their parents were best friends, he says — went to the same college (Notre Dame) and launched a law firm in the late 1970s with Sorrell as his partner (McNeil Murray and Sorrell). But McNeil has ties to the Leddys, too; one of his first hires was John Leddy, T.J. Donovan’s uncle. Sorrell left the practice to return to public service, and John Leddy became a partner in what is now McNeil Leddy and Sheahan. McNeil also coached T.J. Donovan in youth basketball. Donovan and Sorrell each have heavy hitters — with valuable connections — in their corner. Howard Dean has endorsed Sorrell’s reelection bid, and several veteran campaign staffers from the Dean machine are now working for the AG’s campaign. Former governor Kunin is backing Sorrell. Vermont’s first female governor credits Esther Sorrell for encouraging her to run for office in the early ’70s and says she “can’t erase that connection.” Kunin has ties to Bill Sorrell, too; when she became governor, Kunin lured him away from private practice to fill a vacancy as Chittenden County state’s attorney — the job T.J. Donovan now holds. Mahoney says such old-guard connections will be valuable in the attorney general’s primary but won’t be enough to push Sorrell or Donovan to victory. “Both of them are going to have to rely on new people and bringing new energies into that primary race,” he says. Sorrell says he remains close with the Leddys — he attended a January 6 Feast of the Epiphany party at John Leddy’s house this year — and is trying not to let the campaign get personal. For his part, T.J. Donovan is mostly playing down the family history in the campaign. At 38, he’s a generation younger than Sorrell, who turned 65 on March 9. “I certainly know the history and I respect the history, but it wasn’t my experience,” Donovan says. Bernard Leddy died before T.J. Donovan was born, and the state’s attorney says he never met Esther Sorrell. In fact, Donovan says the first time he met Bill Sorrell was in 2006 during Donovan’s first campaign for state’s attorney. Sorrell declined to endorse in the three-way Democratic primary that year, but publicly backed Donovan after he won it. “Joey” Leddy Donovan, T.J.’s mother and a current state rep from Burlington, predicts the families will survive this feud.